KC HiLites Cyclone LED Lights as Under Hood Lights, Rock Lights & More! KC HiLiTES is a widely-trusted and highly depended upon brand when it comes to off-road lighting. KC HiLiTES offers a wide variety of lighting options but today we are talking about their Cyclone LED lights. This is an incredibly universal light that can be mounted almost anywhere. 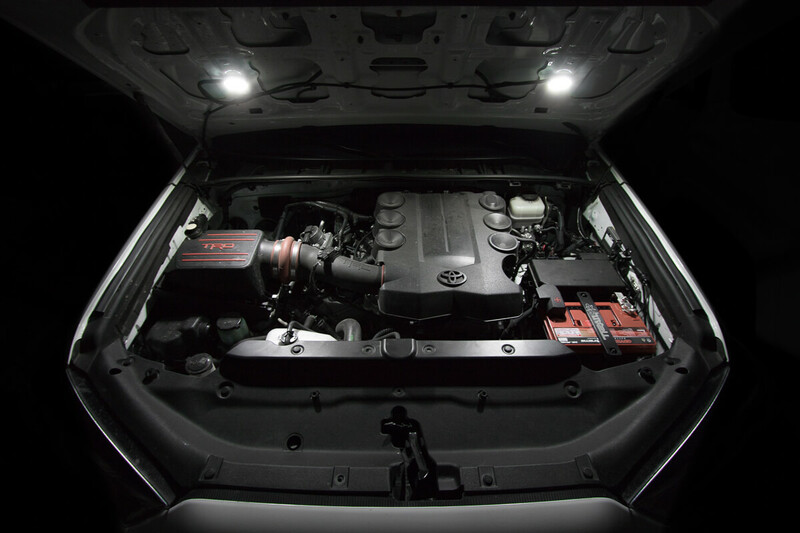 Use your imagination and get creative with the Cyclone LEDs on your 4Runner. You can use these LEDs as rock lights, under hood lights (engine bay lights), interior lights, reverse lights and so much more. 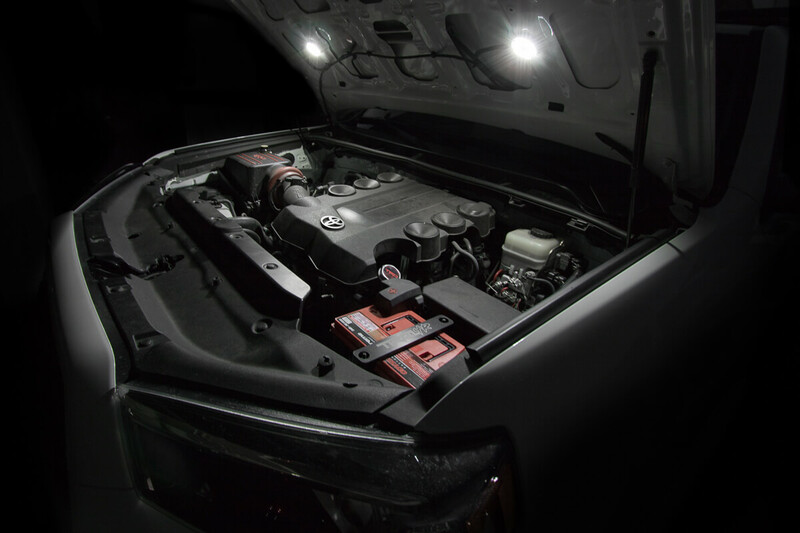 The Cyclone LEDs under hood lights can be purchased as a stand-alone light, or as a complete kit with single or dual light options. 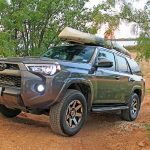 KC HiLiTES make complete rock light kits for JKs but not for the 4Runner. If you want to use these lights as rock lights on your 4Runner, you can either order the JK kit and buy new mounting hardware, or piece it together on your own. You also have plenty of options for colors. KC HiLiTES offers the Cyclones in clear, clear-diffused, green, blue, red, or amber. The 5W LED accessory light kit includes wiring, waterproof switch and one or two Cyclone LED lights, depending on the application. 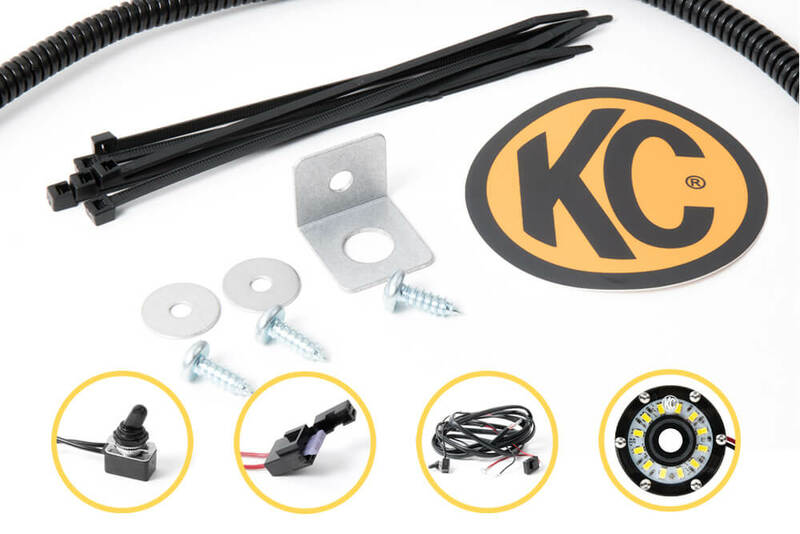 KC HiLiTES makes it easy to add extra utility lighting on your vehicle wherever you want. The Cyclone offers a versatile flood light pattern and each 2.2” diameter light features 12 LEDs at 5W boasting 1100 lumens, and 516 Raw lumens. In a compact package, these LEDs offer an extremely low amperage draw and high output. KC HiLiTES also offer a 23-year warranty. 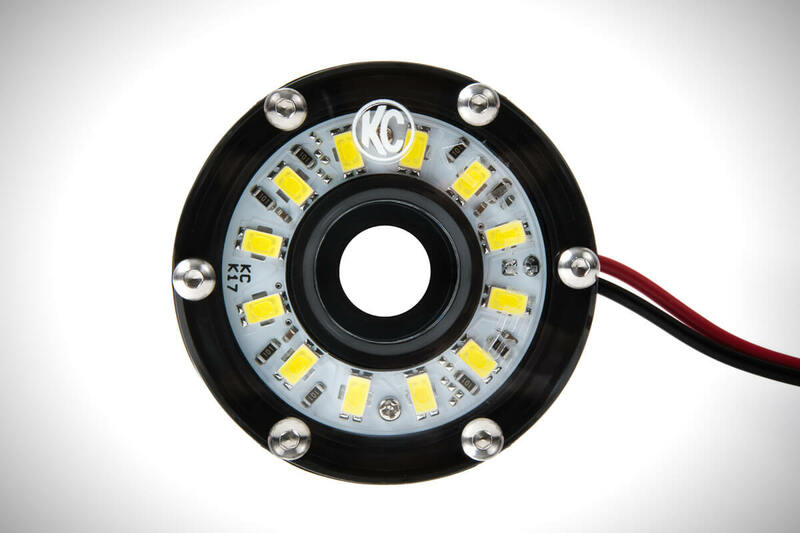 The Cyclone LEDs are made from diecast aluminum IP68 (Ingress Protection – a high of 6 is rated for solid material like dust and the 8 is rated for liquids) rated dust and waterproof housing. An IP68 rating is the highest water and dust resistant Ingress Protection rating you will find. To give you an idea, the iPhone 7 has an IP67 rating. These LEDs can be easily attached anywhere with a Dzus clip or other readily available fasteners that can be purchased directly fromKC HiLiTES. You can also create your own or use the provided hardware in your kit. The Cyclone LED kit ships ready to wire into any 6 to 16V power source. You don’t need much for this install. 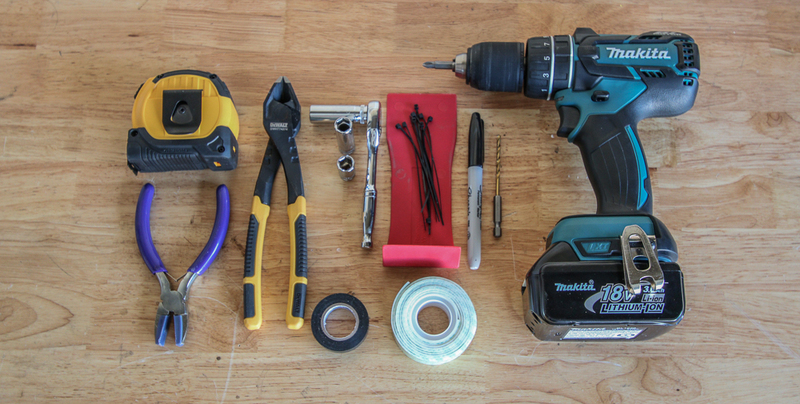 Basic shop tools will get the job done. Before the install, you may want to grab some extra zip ties and double-sided tape. 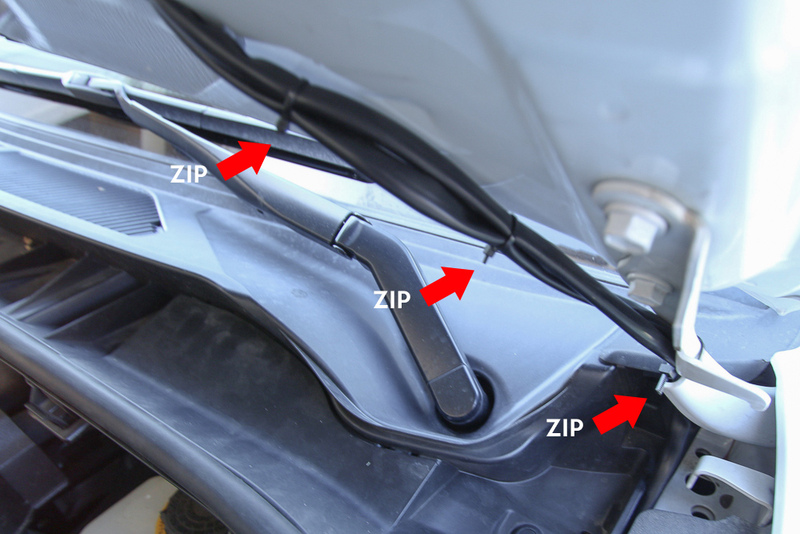 Start by running your wires through the engine bay weather stripping. There is a small gap that is perfect to run these wires through. You will eventually zip tie the wires to the hood on the driver side. 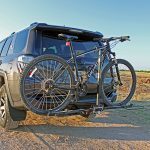 Figure out the best location for your 4Runner. Every set up is going to be different. On the 5th Gen 4Runner, I wanted to mount the cyclone LEDs on the lower section of the hood support ribs about 3.5″ down from the center hole. Take a 1/8″ drill bit and drill a hole through the hood support rib. Attach the cyclone LEDs using the supplied hardware. To prevent drilling straight through your hood use a strong piece of plastic or wood behind the hood support ribs when drilling. I used a plastic pry tool, this worked pretty well. The plastic pry tools are thin enough to fit between the hood support ribs and strong enough to stop the drill bit and prevent it from going through the hood. Route the two red and black wires along the firewall towards the driver side windshield. On the 5th Gen 4Runner, there is an opening in between the black weather stripping and the firewall where you can fit the two pairs of wires. Route your wires through this opening and start feeding the wires into the hood. Run the short wire up through the hood and let it hang on the driver side and then run the long cable over to the passenger side through the openings in the hood support ribs. 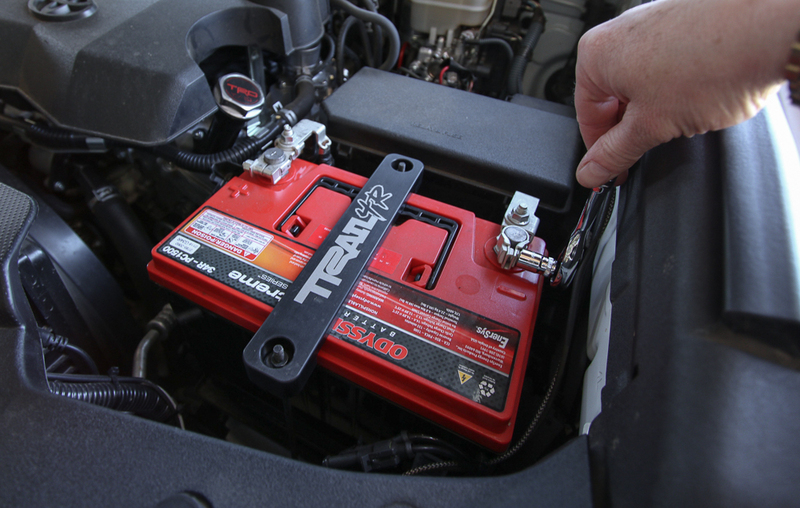 Depending on your current wiring set up you will need to locate an area near the battery along the firewall. You will need to drill a 1/8″ hole in the firewall, then screw down the bracket. Install the switch bracket using the supplied screw. Start by sliding the toggle switch up through the bracket. Then slide on the ON/OFF cover, then screw down the locking nut. The directions recommend installing the switch with the wires pointing towards the battery. For my set up with the Xenon Depot HID wiring harness, the wires facing the cabin worked better for me. I didn’t want to take any chance bending or stripping the tiny lock nut that comes with this kit. I used a pair of rubber pliers (soft touch pliers) to tighten the lock nut down. Then, screw down the rubber toggle switch cover. Your switch is ready to go. You can mount the inline fuse wherever you see fit. I mounted the fuse on the actual fuse box next to the battery. This gave me a perfect amount of positive and negative wiring to connect to the battery. Loosley zip-tie your wires together and connect the Cyclones to the black/red wiring. Once everything is wired up and finished you can use the supplied wiring loom to cover any exposed wires. 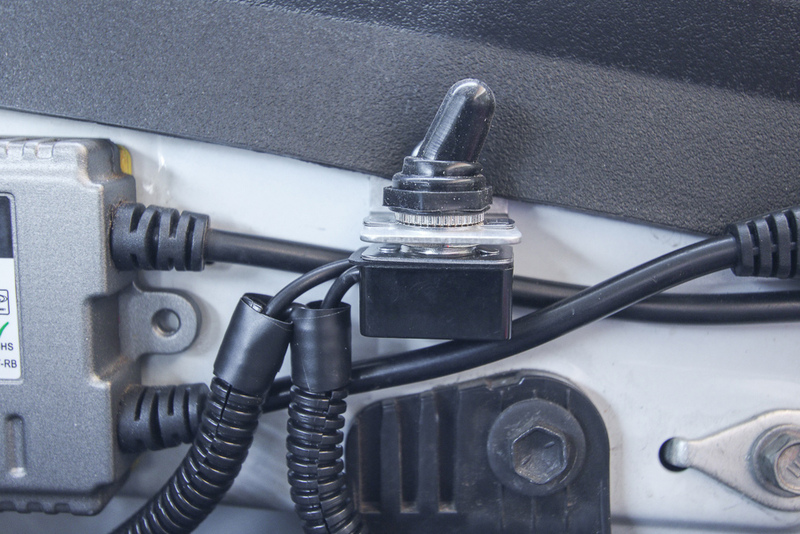 Open and close your hood a few times to make sure all wires stay in place. I had to adjust the wires a few times to make sure the wires stayed in the exact same place. You dont want the wires too tight but you also dont want the wires hanging down to far to catch on something. Once your Cyclone LED lights are mounted and wired you can then return to the battery where you will attach the black ground wire to the factory ground or on the battery. Then install the red power wire to the power positive side the battery. Step 17: Flip the Switch! These lights are seriously impressive. The perfect amount of light. The Cyclones are not too bright and obnoxious. They throw a very smooth floodlight pattern that covers the entire engine bay and some. These shots were taken about an hour after the sun went down. From pitch black to a completely lit up engine bay in about 30 minutes. Questions or Comments about the KC Cyclones? Leave them below! Very doable. Looks nice and thank you for all the details. BTW, why did you upgrade your stock battery? Shaf, they are really nice lights. Super easy installation with the kit. We wrote a post on the battery a couple months ago. After almost 4 years, we were just ready for a new battery. It was taking longer than normal to start and with the addition of new accessories to come, I figured why not. It looks like the light may shine in your eyes a bit when the hood is fully open. Do you find this to be a problem? Pete, not a problem yet. These lights are not overwhelming in terms of brightness. They really are great for the application. It would be interesting to mount them at the top of the hood support ribs to see the difference but I am happy with the location for now. For under hood lights, I think the KC Cyclones are a solid option. I considered the Baja Dome lights as well, but those LEDs are BRIGHT, maybe too bright for under hood lights but to each their own. The angle with the hood fully open and lights on creates a really smooth flood beam pattern on the bay. Pretty happy with them for now. I bought a pair of these same diffused pattern lights at the Overland Expo last month for the same reason (plus I love buying from local AZ companies). I made my own circuitry instead of the kit given my on hand inventory of electrical supplies – but very similar set up… main difference is I reinstalled the hood insulation before screwing in the lights – I’m not trying to fry my paint on the hood anytime soon. Really thorough explanation, thank you! Did you permanently remove the insulation under the hood or replace it after your install? I did not have any insulation on my 4Runner. That is how my hood looked when I bought it. If I had the insulation, I might cut out holes for it and put it back. Thanks for the quick response Brenan. My 2017 cam with an insulation panel clipped to the hood. I agree with you.. best to remove, install the light pods and cut holes and replace. Maybe even print a shroud with a pivoting mount, so you can point it wherever you want. Good idea, Let us know if you find anything! Good thinking! I like that idea too. Seems like it would be nice to have a lighted toggle switch. Whatya think? Trivia: We just bought a red ’17 4R SR5 4×4. Love it. James, yeah that would be pretty nice. You could set up a hood pressure switch wired to a small LED. That would be cool.